Illustrations note 36 Illustrations, color; 5 Illustrations, black and white; XXVI, 141 p. 41 illus., 36 illus. in color. 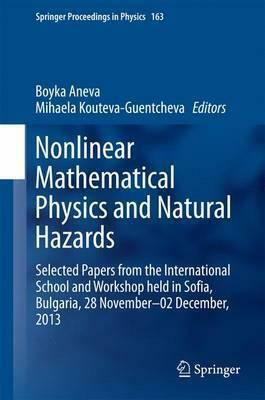 Foreword.- Preface.- Part I Nonlinear Mathematical Physics towards Critical Phenomena.- Predictions and Correlations in Self-Organised Criticality.- The Space-time Structure of Extreme Current and Activity Events in the ASEP.- Quantum Spin Chains and Integrable Many-Body Systems of Classical Mechanics.- Discriminantly Separable Polynomials and their Applications.- MKdV-type of Equations Related to and .- Chaotic versus Regular Behavior in Yang-Mills Theories.- Part II Seismic Hazard and Risk.- A New Probabilistic Shift away from Seismic Hazard Reality in Italy ? .- Steps in Seismic Risk Mapping for the Romanian Capital City.- Romanian Seismic Network since 1980 to the Present.- Seismic Monitoring and Data Processing in Seismological Observation in Seismological Observatory in Skopje - Republic of Macedonia - Basis for Complex Geophysical Research.